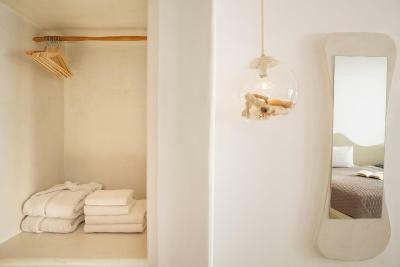 Lock in a great price for Kasimatis Suites – rated 8.8 by recent guests! Staff was always extremely helpful. Gorgeous views and the facilities are equally beautiful. Great hotel and staff, view is incredible. Would be happy to stay again. Staff was unbelievably friendly. Very tranquil property, great location, having seen the entire island on an ATV, I'd choose Kasimatis again if I am ever back. Location was amazing along with the staff. Front desk gives good recommendations! Everything! Clean beautiful location and fantastic friendly staff! The view was absolutely amazing. We will definitely be back to stay here. Great location with a breathtaking view. Very clean hotel in general and the room was well designed. It fit perfectly the romantic mood we were in. Staff member Giorgos was outstanding and very helpful. 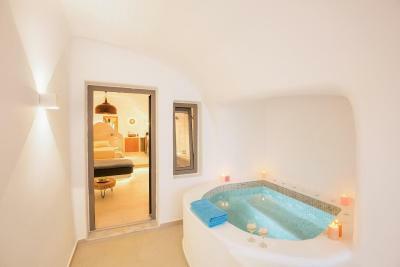 The jacuzzi on our private balcony had the perfect water temperature and was well maintained. The American and the Healthy breakfast were a great choice. 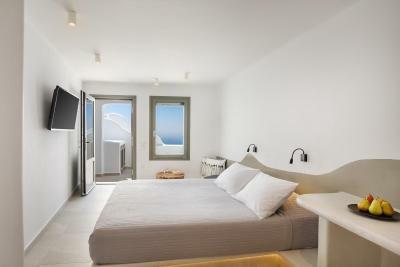 The suite provide immediate access to the Fira-Oia trail. Quiet location with a great options nearby. We had a great time staying here! Place is quiet, clean and well organized. Staff were very helpful and accommodating. View from our balcony was fantastic! Entire staff was very friendly and helpful. Facilities, like the view, are beautiful. Everything was spotless. Kasimatis Suites This rating is a reflection of how the property compares to the industry standard when it comes to price, facilities and services available. It's based on a self-evaluation by the property. Use this rating to help choose your stay! One of our best sellers in Imerovigli! 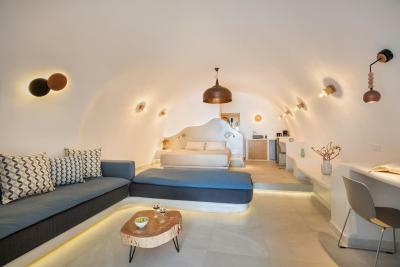 Kasimatis Suites, built in accordance with the Cycladic style, enjoy a privileged location at the top of Imerovigli with breathtaking views of the Blue Aegean Sea and the volcanic island of Santorini. All air-conditioned units offer modern comforts and amenities, such as kitchenette, satellite TV and bathroom with hairdryer. Some accommodations types also feature a spa bath. Continental breakfast is daily served upon request and charges are applicable. Kasimatis Suites provide guests with 14 hour front desk services and free wireless internet in public areas of the hotel. Other facilities include swimming pool for adults/kids, pool showers, library and free parking. 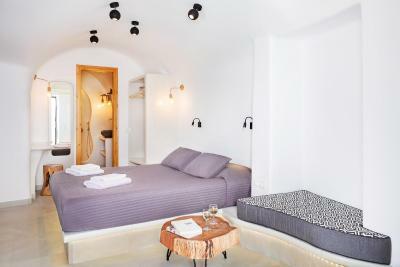 When would you like to stay at Kasimatis Suites? This suite has a patio, air conditioning and mini-bar, and provides access to the communal pool. This premier suite has a balcony with Caldera views, air conditioning and satellite TV. This Honeymoon Suite features a private outdoor hot tub with Caldera views. 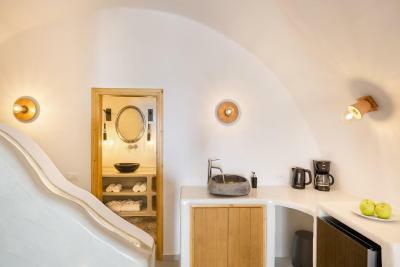 Overlooking the Caldera and the Aegean sea, this deluxe suite features private outdoor hot tub, air conditioning and soundproofing. A sofa, a closet and a safety-box are also offered. 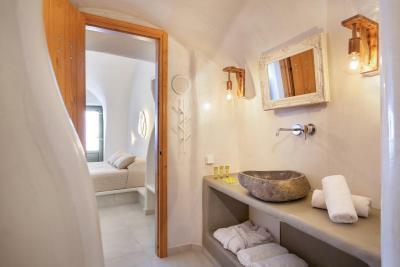 A private bathroom with shower, toiler, hairdryer and slippers are also offered. 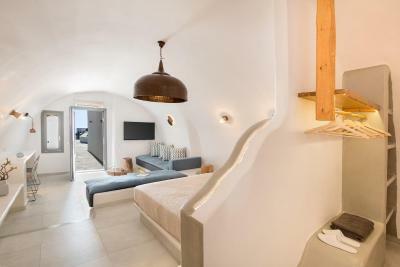 This Cave double room features pool view, a satellite TV, mini-bar and air conditioning. 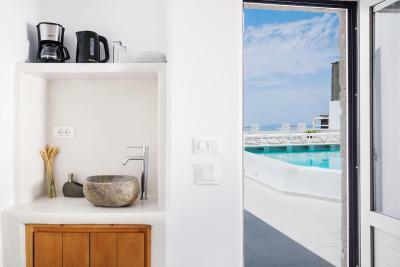 House Rules Kasimatis Suites takes special requests – add in the next step! Kasimatis Suites accepts these cards and reserves the right to temporarily hold an amount prior to arrival. Please inform Kasimatis Suites of your expected arrival time in advance. You can use the Special Requests box when booking, or contact the property directly using the contact details in your confirmation. The view was amazing, exactly as shown in photos. Although there are restaurants in the area, I believe that at Oia there is more stuff to do. There is no cell reception (Vodafone) and WiFi is weak in the room. The bedroom being near the reception walkway, can get a bit noisy especially at night. But these are minor problems. Quiet pricey compared with other rooms this property offers. Stayed at the deluxe suite for a night. The unobstructed and private view from the jacuzzi and balcony is to die for. The rooms are spacious with a fully functional kitchen and hot plate. Generous with the toiletries. Staffs are very helpful round the clock. The breakfast proportion is huge. This jacuzzi does warm the water during the month of April unlike other accommodations that just provides lukewarm water. The Wifi was really really quite poor and would turn on and off randomly but for the most part, it wouldn't work or was extremely slow. The Staff was very friendly and helpful and whenever we had a question, they were extremely helpful and very kind, our requests were always met. The facilities were clean, all of the services there were quite superb and we thoroughly enjoyed our stay. Friendly/helpful staff who went above and beyond to ensure our stay was perfect. The view from the room was amazing and the room itself met all expectations. Special thank you to Konstantinos and our private masseuse Stelio. Water in the pool was cold. Amazing location with beautiful caldera view. 1. Location. By foot you can take hiking road to Thira - 12-15 mins from hotel. This route is near the cliff with amazing view. Or you can take another direction - to Oia - 2.3 hours. Or just go up through main entrance of the hotel, via Imerovigli - 15- 20 mins to Thira. 2. Hot tubs at the rooms are really hot and it helps during the start of the season. 3. Food. Breakfast is always filling, there is variety of things. Everyday fresh bread and pastries. 4. People. It was great experience, we would like to thank team of hotel for help, everything was perfect. 5. 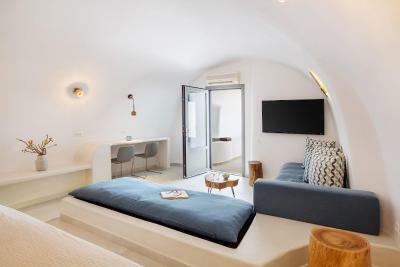 Cave suites are great for hot weather. Nevertheless with help of heating system it’s not cold in mild weather too. There is a utility box in the room with LED lights and there is no way to turn it off. We had to use clothes and tape to cover it in order to sleep at night. Easily solved by having a blackout cover for it. Phenomenal view from our private room and jacuzzi. Excellent staff, always ready to help regardless of time! Right on the caldera, but you cant hear any of the foot traffic, and a completely unobstructed view of the bay, Oia, and the islands! Our only issue was the room we were allocated was not as described on the website but we did get it changed when another became available. The water of shower has little bit small, and the external air condition loose a little water. But it doesn’t metter the fact of prefect suite. The suite reserve for us is perfect, see all the sea and very comfortable, clean. The personal are gentile and available, they prepare also the mini breakfast for us since our early flight. We really have a nice stays in here and hope to have a chance to come back.